Wilson's engine compartment seal (411 813 225) was disintegrating on touch, so I went ahead and removed it. 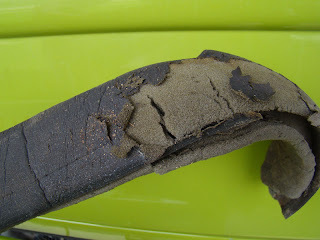 This is the foam seal that runs along the length of the engine tin. It seals the engine compartment so hot air isn't pulled into the compartment. I am already cleaning up the engine compartment and this will be an important part to replace before I drive again, but I am going to wait until the fuel components are back in place. If I have to pull the tank, I do not want to accidently rip the new seal. I purchaced a replacement seal from germansupply.com and It is just sitting on a shelf, waiting for me to replace it. I should have this job complete by next month. I am glad I removed the original seal. 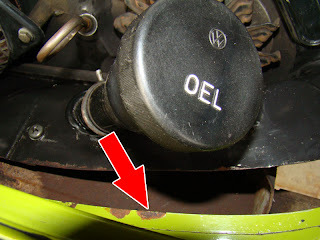 I found a couple small rust spots where the seal ran around the engine compartment, near the oil (OEL) fill tube. The seal must have trapped in moisture. It disintegrated so much; parts of it are still stuck to the firewall in the back. I'm slowing getting it all cleaned off. Once the compartment is clean, I will sand down the spots and treat them with POR-15 before touching it up with paint. I'll post pictures of the compartment and new seal later this summer. . .